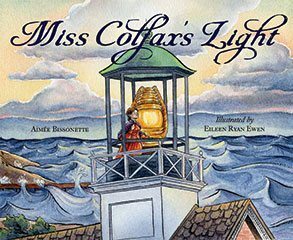 We are pleased to fea­ture Miss Colfax’s Light as our June book selec­tion, in which author Aimée Bis­sonette and illus­tra­tor Eileen Ryan Ewen tell the fas­ci­nat­ing sto­ry of a woman who served as the Michi­gan City Light­house keep­er from 1861 to 1904. Cap­tains and nav­i­ga­tors on Lake Michi­gan relied on her light­house to keep them from founder­ing on the rocks or crash­ing onto the shore in rough weath­er. Every day heroes. That’s how author Aimée Bis­sonette refers to the peo­ple in his­to­ry who intrigue her. She trav­eled to research her cho­sen sub­ject, Har­ri­et Col­fax, talk­ing with peo­ple in Indi­ana who could proud­ly pro­vide infor­ma­tion. Miss Col­fax faith­ful­ly kept a log, so Aimée was able to read about Harriet’s work and her dai­ly life in Harriet’s own words. Illus­tra­tor Eileen Ryan Ewen paint­ed a wealth of accu­rate, time-appro­pri­ate details into the pages of the book, help­ing read­ers visu­al­ly under­stand the time in which Miss Col­fax lived. We think you’ll be inspired by Miss Colfax’s sto­ry as much as we are. In each Book­storm™, we offer a bib­li­og­ra­phy of books that have close ties to the the fea­tured book. You’ll find books, arti­cles, and videos for a vari­ety of tastes and inter­ests. This month, we’re focus­ing on books about Amer­i­can light­hous­es, light­house keep­ers, and biogra­phies of female heroes. You’ll find more infor­ma­tion about Aimée Bis­sonette on her web­site. The illustrator’s web­site will show you more of Eileen Ryan Ewen’s port­fo­lio. About Light­hous­es. For back­ground infor­ma­tion as you pre­pare to excite stu­dents, library patrons, or your fam­i­ly mem­bers about Amer­i­can light­hous­es, these books will help you locate these bea­cons of safe­ty, learn more about their oper­a­tion, and under­stand the sci­ence and math that are an inher­ent part of the work­ings of light­hous­es around the coun­try. Brave and Extra­or­di­nary Women. From pic­ture book biogra­phies to short-arti­cle antholo­gies, you’ll find a vari­ety of inspir­ing sto­ries from oceanog­ra­ph­er Sylvia Ear­le to edu­ca­tion­al activist Malala Yousafzai. How Light­hous­es Work. From the Fres­nel lens to the Chance Broth­ers engi­neer­ing to the improve­ments in fuel, increas­es in the range of light, and Edison’s inven­tion of the light­bulb, you’ll find books to inform your pre­sen­ta­tions and dis­cus­sions about Miss Colfax’s Light. Light­house Books. 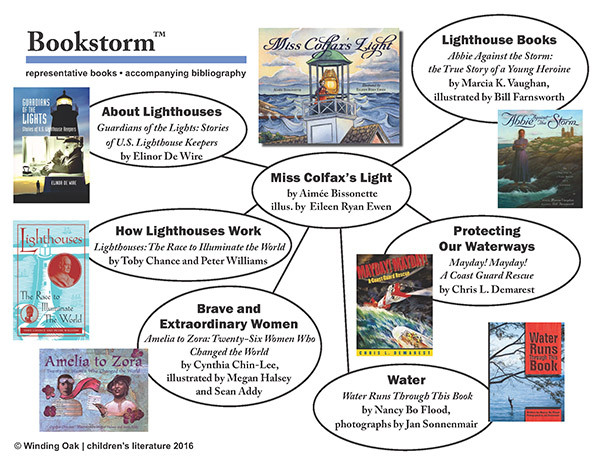 There are a num­ber of good books to pair with our fea­tured Book­storm. Com­pare the true sto­ry of Miss Col­fax with that of Abbie Burgess, who took her light­house keep­er father’s place dur­ing an ice storm, or the Maine Fly­ing San­ta pro­gram, or the Lit­tle Red Light­house near the George Wash­ing­ton Bridge in New York City, among many oth­ers. Pro­tect­ing Our Water­ways. In addi­tion to our light­house keep­ers, the U.S. Coast Guard is on duty pro­tect­ing water trav­el­ers and ship­ping ves­sels dur­ing all types of weath­er and in haz­ardous sit­u­a­tions. These books will extend read­ers’ under­stand­ing of the work done by high­ly skilled patrols. Water. Before and after read­ing Miss Colfax’s Light, it’s a good time to have a dis­cus­sion about the impor­tance of water in our lives. From our Great Lakes, to our coastal waters, to the rivers and lakes through­out our coun­try, to the water that falls from the sky, to the water that is pumped up from under­ground aquifers, water and water con­ser­va­tion are essen­tial to our every­day lives. Whether you choose to focus on every day heroes, water, sci­ence, Great Lakes com­merce, or inspi­ra­tion women, there are many direc­tions you can go and many sub­jects you can sup­port with Miss Colfax’s Light.